is a genre of film, television, and theatre in Japan . The name means "period drama", and the period is usually the Edo period of Japanese history, from 1603 to 1868. Some, however, are set much earlier — Portrait of Hell, for example, is set during the late Heian period — and the early Meiji era is also a popular setting. Jidaigeki show the lives of the samurai, farmers, craftsmen, and merchants of this time. Jidaigeki films are sometimes referred to as chambara movies, a word meaning "sword fight", though chambara is really a sub group. They have a set of dramatic conventions including the use of makeup, language, catchphrases, and plotlines. Many jidaigeki take place in Edo, the military capital. Others show the adventures of people wandering from place to place. The long-running television series Zenigata Heiji and Abarenbō Shōgun typify the Edo jidaigeki. 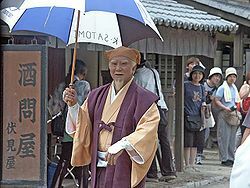 Mito Kōmon, the fictitious story of the travels of the historical daimyo Tokugawa Mitsukuni, and the Zatoichi movies and television series, exemplify the travelling style. Another way to categorize jidaigeki is according to the social status of the principal characters. The title character of Abarenbō Shogun is Tokugawa Yoshimune, the eighth Tokugawa shogun. The head of the samurai class, Yoshimune assumes the disguise of a low-ranking hatamoto, a samurai in the service of the shogun. Similarly, Mito Kōmon is the retired vice-shogun, masquerading as a merchant. In contrast, the coin-throwing Heiji of Zenigata Heiji is a commoner, working for the police, while Ichi (the title character of Zatoichi), a blind masseur, is an outcast, as were many disabled people in that era. In fact, masseurs, who typically resided at the bottom of the professional food chain, was the one of the only vocational positions available to the blind in that era. Gokenin Zankurō is a samurai, but due to his low rank and income, he has to work extra jobs that higher-ranking samurai were unaccustomed to doing. Sengoku-jidai (Warring States era setting) is a Japanese genre that has been used as the setting for novels, films, video games, and even anime and manga. It bears some parallels with the Western; Akira Kurosawa's Seven Samurai, for example, was remade in a Western setting as The Magnificent Seven. The famous anime and manga series InuYasha is set in this period despite some moments that were set in the modern era. The warrior class included samurai, hereditary members in the military service of a daimyo or the shogun (themselves samurai). Ronin, samurai without masters, were also warriors, and like samurai, wore two swords; they were, however, without inherited employment or status. Bugeisha were men, or in some stories women, who aimed to perfect their martial arts, often by travelling throughout the country. Ninja were the secret service, specializing in stealth, the use of disguises, explosives, and concealed weapons. What would a jidaigeki be without characters to give the flavor of the times? Jugglers, peddlers, fortune-tellers, candy-sellers, rag-pickers, blind moneylenders, itinerant singer/shamisen-players, effete courtiers from the imperial capital at Kyoto, the Dutch kapitan from Nagasaki, streetwalkers and prostitutes from the licensed and unlicensed quarters, the million-dollar kabuki actor, flute-playing mendicant komusos wearing deep wicker hats, and of course geisha, provide a never-ending pageant of old Japan. In long-running TV series, like Mito Kōmon and Zenigata Heiji, the lead and supporting actors sometimes change. This is done without any rationale for the change of appearance. The new actor simply appears in the place of the old one and the stories continue. This is similar to the James Bond film series. In a sword fight, when a large number of villains attacks the main character, they seldom act simultaneously. Instead, the villains wait their turn to be dispatched, often standing motionless until their turn to be easily defeated arrives. On film, most often the violence is considerably stylized, sometimes to such a degree that sword cuts cause geysers of blood from wounds. Dismemberment and decapitation are also common. In addition, the authors of series invent their own clichés in the kimarizerifu (catchphrases) that the protagonist says at the same point in nearly every episode. In Mito Kōmon, in which the eponymous character disguises himself as a commoner, in the final swordfight, a sidekick invariably holds up an accessory bearing the shogunal crest and shouts, Hikae! Kono mondokoro ga me ni hairan ka? : "Back! Can you not see this emblem? ", revealing the identity of the hitherto unsuspected old man with a goatee beard. The villains then instantly surrender and beg forgiveness. Likewise, Tōyama no Kin-san bares his tattooed shoulder and snarls, Kono sakura fubuki o miwasureta to iwasane zo! : "I won't let you say you forgot this cherry-blossom blizzard!" After sentencing the criminals, he proclaims, Kore ni te ikken rakuchaku: "Case closed." For content set in (or largely in) the Edo period, see Edo period in popular culture. Downtown Special: Kunio-kun no Jidaigeki dayo Zen'in Shūgō - sequel to Downtown Nekketsu Monogatari (River City Ransom in America) set in feudal Japan. Names are in Western order, with the given name, then the family name. A Man, a Blade, an Empty Road: Postwar Samurai Film to 1970 by Allen White on Greencine, this article discusses specific chambara films, their distinction from regular jidai-geki, and the evolution of the genre.